No, not the caramel coated kind. The kind that wins cases. The kind that deftly avoids going to court—or deftly wins in court (including the Supreme Court). 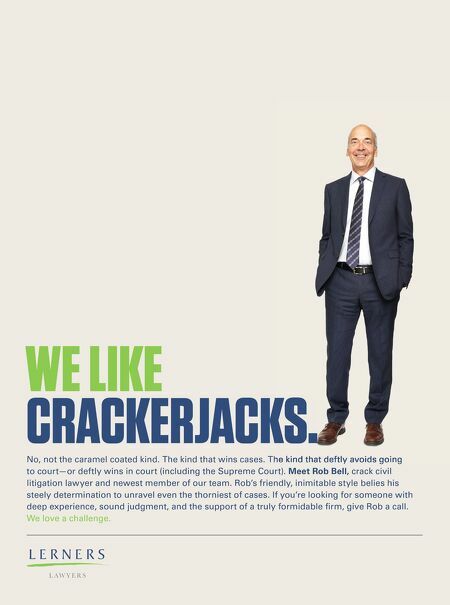 Meet Rob Bell, crack civil litigation lawyer and newest member of our team. Rob's friendly, inimitable style belies his steely determination to unravel even the thorniest of cases. If you're looking for someone with deep experience, sound judgment, and the support of a truly formidable firm, give Rob a call. We love a challenge. WE LIKE CRACKERJACKS. No, not the caramel coated kind. The kind that wins cases. The kind that deftly avoids going CRACKERJACKS.